Folosind DAF PACCAR DAVIE Devkit Tool puteti programa Adblue off pe camioanele DAF. De asemenea, este posibil sa schimbati cuplul motorului precum si adaugarea limbii ruse in tabloul de bord. As an option you can buy DAF/PACCAR DAVIE developer tool, a software that allows you to reach and change parameters and functions on DAF heavy vehicles that are available only for genuine DAF services. This software makes a lot of things easier to do and saves your time. 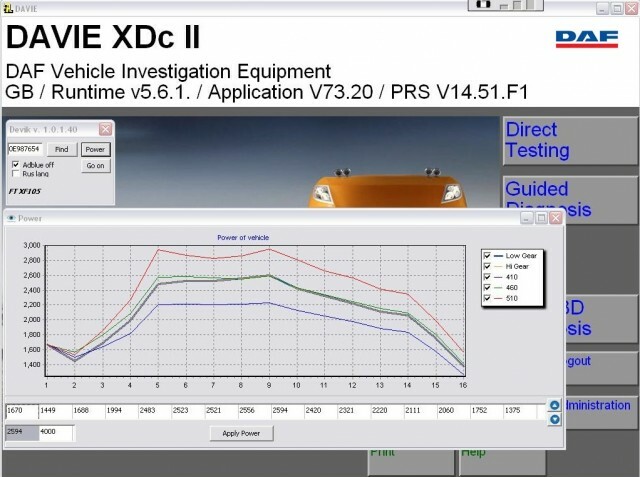 DAF/PACCAR DAVIE developer tool is tested on Windows XP OS, USB HASP key (licence key) makes this software more mobile.